Development machine ｜ SEIMITSU SPRING Co.,LTD. Combining the "technology" by man, and "automation" by a machine, our company holds down cost as much as possible, and, moreover, realizes high quality with a various kind. 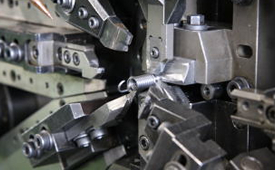 In the manufacturing site, the product is carefully made in order of the right work. Even if it is mass-produced goods, such as partly-finished goods of a car, our company is doing development manufacture of the automatic sorter so that the quality of all the products can be guaranteed. In recent years, our company developed the machine which sorts out the product which uses an imaging sensor. 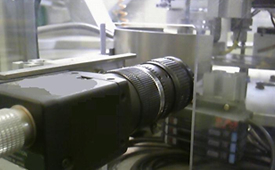 Since it was able to carry out digital conversion of the picture of a CCD camera and two or more edge detection was performed simultaneously, it became possible to perform high-speed and highly precise sorting. Manufacture was very difficult although the high-tension spring had an advantage from which it is a small space and high load is acquired. Our companies are the accumulated know-how and the optimal machine, and are manufacturing the strong high-tension spring more than double from the ordinary product. 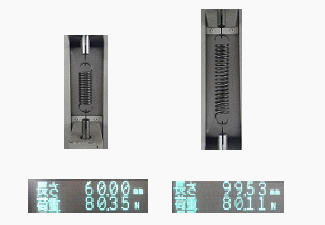 The performance comparison result of a common spring and a high-tension spring becomes as it is shown in the following figure. 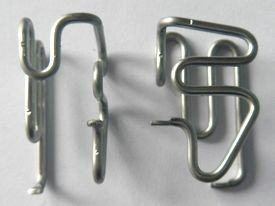 The high-tension spring and common spring of the same form are compared. Moreover, we are building the technology in which product processing in the domain beyond the JIS standard processing range is possible. Our company has the technology which not only a Nichrome wire but "iron and a chromium ray" with difficult processing can process. Iron and a chromium ray are effective in the substitution raw material of a processing Nichrome wire, and the cost of materials is about 1/3. In our company, it is possible to process complicated form under about the same quality and Productive time. Equipment is developed in cooperation with educational facilities. 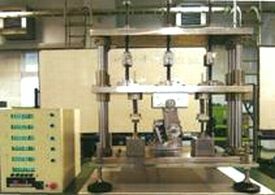 The conventional durability-test machine was large-sized, and flexibility was not sometimes effective frequently. Then, in cooperation with educational facilities, it was compact and developed the equipment moreover equipped with the controlling function of an examination situation. ※It can use for a compression spring and tension spring. Our company is doing development and sale of a budget prices automatic savings machine. The unmanned operation by mass production increased. Since our company thought that risk management was required, it developed the equipment which can divide a manufacture lot. It is the equipment with which the box containing the manufactured product can be replaced by a definite period of time. 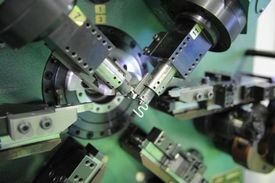 Therefore, manufacture became possible at low cost. More than one welder, the slide system spot welding robot has been developed to produce the product which exists. It itself slid, and to weld a robot, I made sure that you can produce the product in which (more than one processes of yagu) exists by once's arrangements.